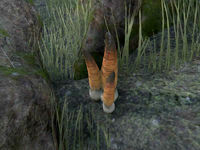 Stinkhorn is an white, orange and brown fungus reminiscent of a carrot in shape. It can be used as an alchemy reagent. It can be found growing in all zones, except for the very first zone of your Alliance. Like the other mushrooms, it tends to grow at the base of trees and around rocks, not in open spaces. This chart lists only combinations in which two or more of Stinkhorn's effects are present. This page was last modified on 14 December 2018, at 00:07.